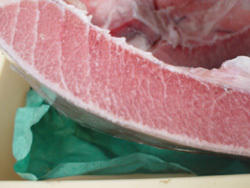 “Kihada maguro” or Yellowfin Tuna” will appear soon on our tables from early summer. 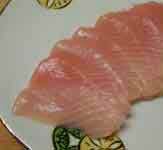 It is mainly caught off Shizuoka, Miyagi and Kochi Prefectures coasts. Kihada roams over many seas between 30 degrees north latitude and 30 degrees south latitude and even wider depending on the season. Very recognzable for its pinkish colour. A lot is imported frozen. 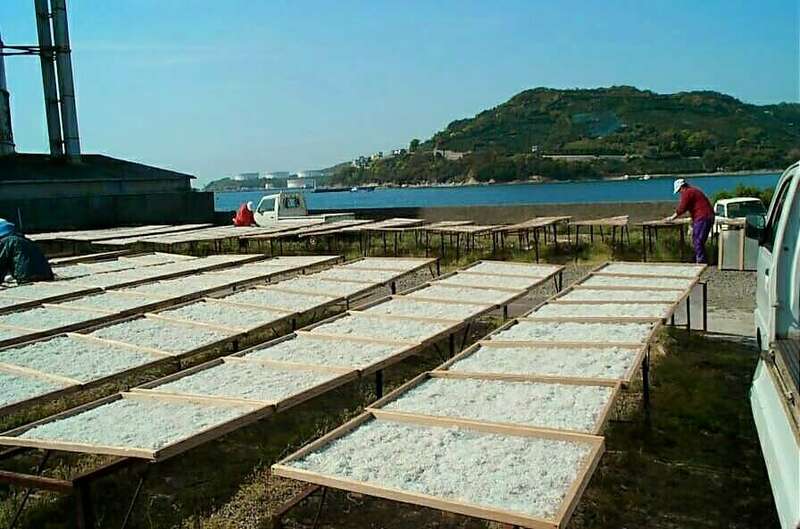 In Shizuoka try to go for the freshly caught samples coming from Yaizu or Numazu. Yesterday my better (worse?) 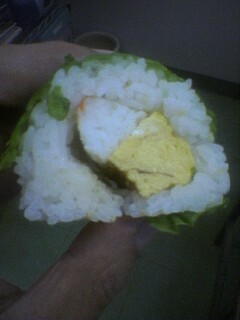 half came up with another great simple tasty homemade sushi for my “bento bako” (packed lunch). I took this picture at Tomii Restaurant, Shizuoka City, Aoi-Ku, a favourite of mine for their superlative Kyoto-style food, great sake and shochu. Since I took pity on friends like Barnaby, I will tell you what I was served! 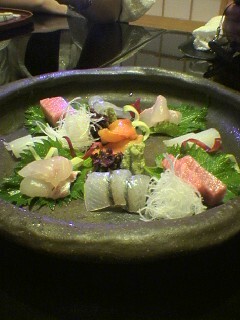 Left, “katsuo” (bonito) with grated with ginger and chopped thun leeks, “ika” (squid) in the middle. Behind ika, “tai” (seabream). 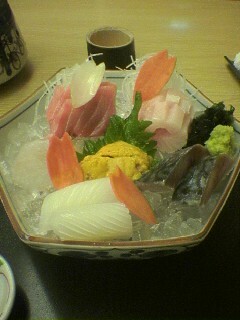 Right is “uni” (sea urchin) atop “yuuba” (“tofu skin”). The greens behind are: left, “shiso” (perilla/steak plant) and right, “wasabi” (Japanes green horseradish leaves). Could you give the names of each ingredient? 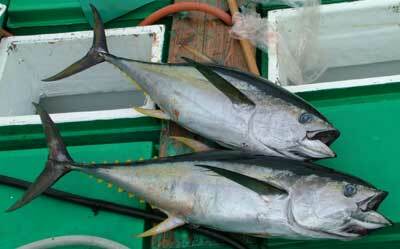 THere seems to exist a great confusion about two different fish in Japan that stumps even quite a few Japanese! 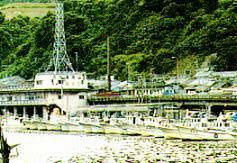 Actually there should not be any problem as they are caught in totally different: whereas “shirasu” is almost exclusively caught in Suruga Bay in Shizuoka Prefecture where the most important shirasu fishing harbour is in Mochimune, Shizuoka City. 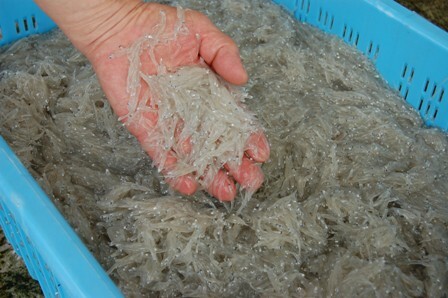 “Shirasu” is whitebait, that is a fish in its infancy, of the “katakchi iwashi”, a sardine variety. 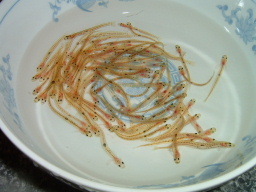 “Shirauo” is a totally different fish, usually called “Japanese anchovy” which is mainly caught in Kyushu and Kanto. The color and the size are different. 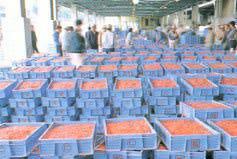 Most of the shirasu caught off Mochimune goes through the hands of the local dealers at the harbour. Fresh it can be eaten on a gunkan with a dash ograted ginger, some finely chopped thin leeks and wasabi. 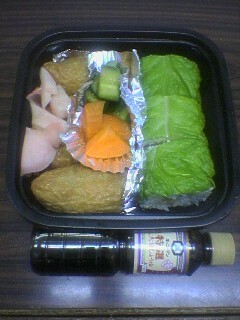 Or it can be served fresh as it is as “tsumami” (hors d’oeuvre) in ponzu and some fine greens. 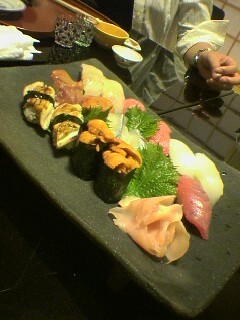 There are many variations according to the sushi chef! 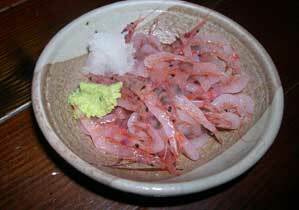 Shirasu can also be dried like “sakura ebi” and put to many uses. 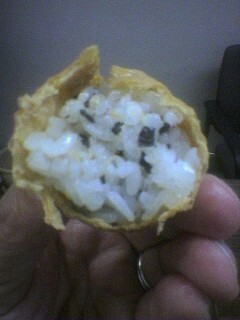 It can added to rice, mixed with dried shrimps, and so on! 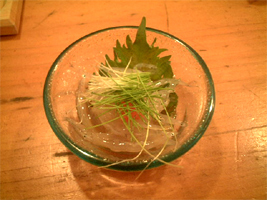 “Sakura Ebi” or Sakura shrimp is a vey small (maximum 5 cm) crustacean caught in the Suruga Bay of Shizuoka Prefecture. Most of ships are anchored in Yui City (will become part of Shizuka City soon) Harbour. 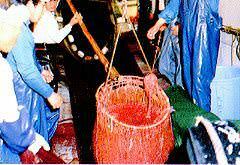 The shrimps are caught in special net baskets according to long traditions before they are put on the market immediately for auction. Many fishermen open their own sushi restaurants, bars and often their catches of the night until early in the afternoon before taking a well-earned sleep. 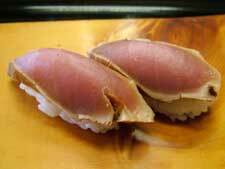 For people who prefer them as sushi, the gunkan style is the most appreciated! Most French and Italian Restaurants in Shizuoka City and around will serve them in quiches! 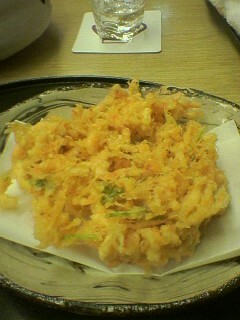 Another popular way to eat them is of course as a tempura called kaki-age, either with fresh sakura ebi in season or dried ones. Fishermen use to dry their catch for sale and export until the government had the great idea to run an expressway just along the harbour! 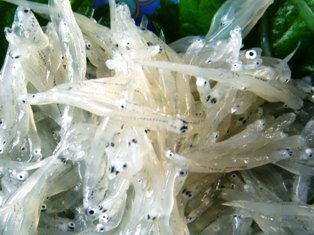 The shrimps are now dried along nearby Fujikawa River, creating large quaint rose expanses in the most useen for locations! In 1965 Yui Fishermen created an Association of their own to decide each year’s toatl catch so as prserve stocks and preserving the environment. A salutary initiative long before normal citizens became aware of conservation and environment! It has different names according to the areas: “Darumashibi” (Mie Prefecture), “Mebuto” (Kyushu). In Tokyo, Shizuoka and Wakayama, it is called “Daruma” when caught a young age. The best seasons for catching are during the rainy season or the Fall. 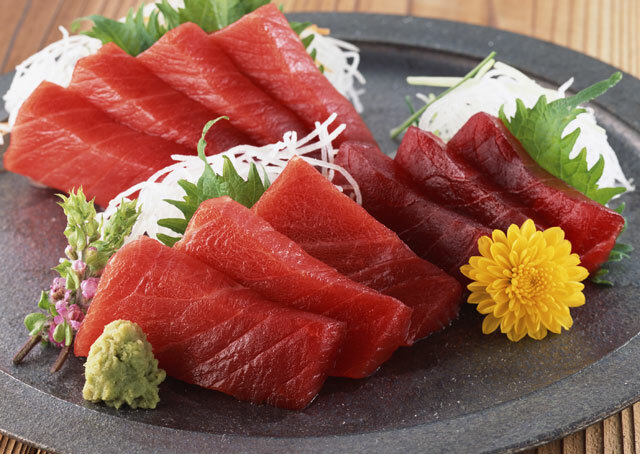 This kind of tuna is mainly caught off the shores of Miyagi, Kagoshima, Kochi, Shizuoka, Kanagawa and Hokkaido Prefectures. 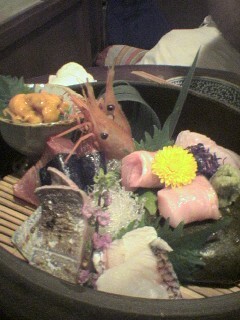 Inthe fall it is also a source of toro (fatty part) when kuromaguro is not available. 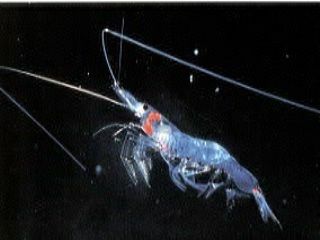 In recent years it has been extensively caught in the Pacific, Atlantic and Indian Oceans and in the Mediterranean Sea. 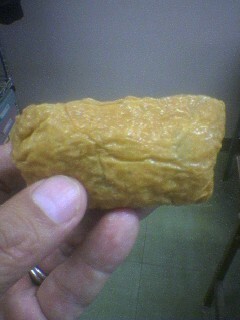 It also come frozen from Chile, Peru and North America. It is also flown fresh from Australia, Indonesia and New York. A lot equally comes frozen from South Korea and Taiwan.